HSY Yachts is preparing to launch its 56 metre Hargrave 184 superyacht, which will become the US yard’s flagship when it hits the water. 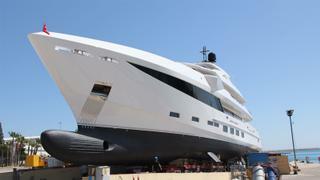 The yacht, which is the owner’s fourth Hargrave, features a beam of 10.4 metres and 499GT. 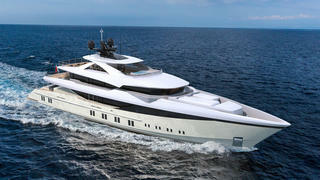 Currently in build in Turkey, the tri-deck yacht features a steel hull and aluminium superstructure. It was first revealed by Unique Yacht Design in February 2017 as a superyacht concept for the Antalya-based yard. Naval architecture and interior design meanwhile has been handled in-house by the yard. It is believed construction on the yacht began in April 2017 and her launch is imminent. Accommodation is for 12 guests split between six cabins including a main-deck full-beam owner’s cabin, an upper deck VIP near the captain’s cabin and four guest cabins on the lower deck. Six further crew cabins are located on the lower deck, bringing the total staff capacity up to 11, and Caterpillar is providing the engines. No interior images have been released yet, but several rectangular portholes suggest that the interior will be flooded with natural light. Tinted floor to ceiling glazing on the main and upper decks allow for great views out to sea without compromising on privacy. Key features include a superyacht elevator that provides easy access from the lower deck all the way up to the vast sundeck and its superyacht spa pool, while the foredeck storage boasts enough room to house multiple tenders and Jet Skis.